Werther, an intense young man, falls madly in love with Charlotte – only to learn that she is engaged to her childhood friend Albert. Following Charlotte’s marriage, the despairing Werther threatens suicide. Will Charlotte admit that she loves him before it is too late? The libretto of Werther is based on the bestselling novel Die Leiden des jungen Werthers (The Sorrows of Young Werther) by Goethe, first published in 1774. Goethe’s inspirations for his novel included the suicide of his friend Karl Wilhelm Jerusalem, and his own experience of an unrequited passion for a girl named Charlotte. Massenet softened Goethe’s story, above all by making it clear that the love between Charlotte and Werther is mutual. Benoît Jacquot’s production contrasts the intense emotions of Werther and Charlotte with the repressive society in which they live. Charles Edwards’s sets take us from a sun-dappled courtyard in the optimistic Act I via a bleak terrace in Act II and a gloomy drawing room in Act III to Werther’s attic room, where the lovers are reunited as snow falls outside. Christian Gasc’s elegant period costumes include an elegant night-blue suede coat and breeches for Werther – his preferred dress as specified by Goethe. Massenet’s score for Werther is one of his most skilful; through-composed but with some beautiful arias. Poignant use is made throughout of recurring musical ideas. These include a troubled motif linked to Werther’s suicide, and the beautiful ‘Clair de lune’ fragment, first heard in Act I as Charlotte and Werther return from the dance. The ‘Clair de lune’ music returns with passionate intensity in Act IV when Charlotte finally confesses to Werther that she loves him. Werther was first performed at the Vienna Hofoper in 1892. It was well received there and later (after an initially mixed reception) had success in Paris. However, its London premiere in 1894 was a failure, and the opera didn’t enter The Royal Opera’s repertory until 1979. 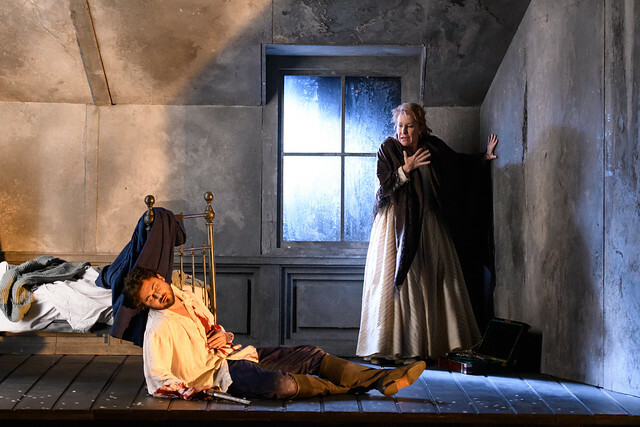 It has since won worldwide acclaim as one of Massenet’s finest scores, and Werther and Manon are currently the only two of Massenet’s many operas still to be regularly performed. Werther runs 19 June–13 July 2016. Tickets are still available. The production will be broadcast live to cinemas around the world on 27 June 2016 – find your nearest cinema. The production is generously sponsored by BB Energy and is given with generous philanthropic support from Mrs Susan A. Olde OBE, The Taylor Family Foundation, Susan and John Singer, Spindrift Al Swaidi and the Maestro’s Circle. Gracias por la oportunidad de poder compartir toda Europa en vivo una de las más románticas de todas las óperas.